All transactions are safe and secure with a reliable history in online purchasing behind each of our associates. Buy the Etch A Sketch Juno Rainn Wilson Quote t-shirt to own Juno clothing and merchandise. The design on this humorous Juno t-shirt captures the memorable comment that Rollo (Rainn Wilson) makes to a possibly pregnant Juno. As she shakes her pregnancy test like an Etch A Sketch, Rollo tells her, "This is one doodle that can't be undid homeskillet." 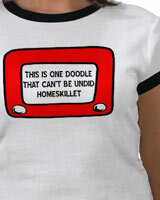 The Juno Rainn Wilson quote is displayed on the screen of the Etch A Sketch featured on the front of this tee shirt. Just remember that shaking the wearer won't clear the screen. In addition to the Etch A Sketch Juno Rainn Wilson Quote tee above, browse the Juno Clothing Gallery for more apparel like men's and women's clothes, kids shirts or hoodies.